Manager Eddie May has backed Carl Finnigan to become Falkirk's main striker after handing the 22-year-old Englishman a new one-year contract. May, who was appointed this summer, said: "Last season was very difficult for Carl after he caught an illness. "It caused him to miss a significant part of the season and he never really got going, but he has returned to training and is looking fantastic. "With a sustained run in the team, I am sure he can become our main striker." May pointed out that Finnigan, whose deal includes an option of an additional year, had "a tremendous goal-scoring record with Newcastle United's reserve side". "Carl is a real confidence player and I have faith that he can do very well for the football club this season," said the manager. More responsibility will fall on Finnigan after Falkirk lost Michael Higdon this summer, the Englishman signing for Scottish Premier League rivals St Mirren under freedom of contract. 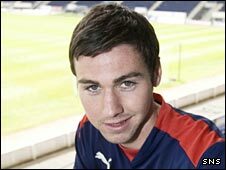 Fellow striker Steve Lovell left Falkirk Stadium after being told he would not be offered a new contract. Finnigan, who joined the Bairns after leaving Newcastle in 2007, was looking forward to improving on last season's five goals in 19 appearances. "I hope this season will be a better one for me and the club," he said, recalling that the Bairns escaped relegation on the final day of the season. "Last year, I had terrible problems with injury. This year, I hope it can be a long and injury-free season. "So far, pre-season has been really good and we can't wait to get down to business against FC Vaduz." Falkirk open their campaign on 16 July in the Europa League qualifier against the Liechtenstein-based side who play in the Swiss Super League.